This line amplifier will boost cable and DBS signal. If the output of a single wire multi-switch is split to multiple rooms or apartments, the receiver signal levels are low after 200 feet of RG-6 cable. 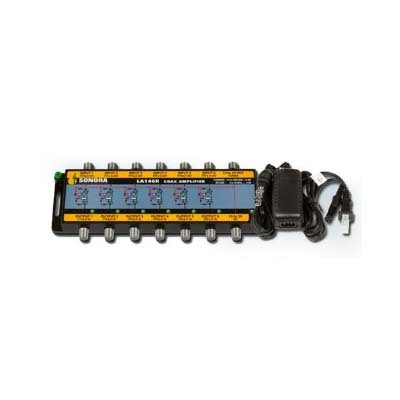 Model LA141R-T boosts basic cable and DBS signal level off-setting the loss of an 8-way splitter while passing data modem and receiver control signals from the receiver to the switch.DIRECTV™ approved. Product-specific information: Product details, PDF specifications, Dimensions. The Sonora LA281R-T SWM8 line amplifier boosts cable and DBS signal levels off-setting the loss of 300 feet of RG-6 while passing data modem and receiver control signals from the receiver to the switch. DIRECTV™ approved. Product-specific information: Product details, Specifications, Dimensions. The LA-520 is our most versatile line amplifier with wideband capabilities from 50 to 2050 MHz and 20 dB gain. DIRECTV™ approved. Product-specific information: Product details, Specifications, Dimensions. The Sonora LA285A-T 5 LNB KA/KU line amplifier boosts the video signal for a 28 dB gain. Includes a 12 volt, one amp power supply. DIRECTV™ approved. Product-specific information: Product details, Specifications, Dimensions.